Contrary to what it may appear, I do not spend every waking moment of my life thinking about Tolkien. In fact, late last year, I tried to launch another blog that would cover every interest of mine *NOT* having to do with Tolkien. Though that blog never really gained traction, over the last few months, I’ve had the epiphany that there really is no good reason I couldn’t be blogging about all those other things over here. Don’t worry. This is not the end. Now before I tell you about what will be changing, let me assure you that one very important thing won’t be changing: I’ll still be writing a lot about Tolkien. In fact, I’m working on another book about one of Tolkien’s most important works right now, and I can’t wait until it’s at a point where I’m ready to tell you more about it. Like Tolkien’s Requiem, I think it’s going to stand out as a truly unique work. And with the release of Beren and Lúthien coming next year, there’s so much more to say about that story. I am an inveterate music lover. Several years ago, I had a music blog where I would write about my favorite records. I gave it up for some reason, but for the last year I have been hungry to undertake writing about music again. I will be writing about the music I love from a very personal perspective, because I really can’t stand “3rd party omniscient/God’s eye view” music criticism. For a hint at my musical taste, here’s a list of some albums I particularly love. That list could be much longer. I’ve also mentioned my music project (pale horse sailor) here before, and there’s a lot to come from PHS (that’s what all the tastemakers are calling it – Kanye’s idea) in 2017. I’m very excited about sharing my own music with you. Please do check out my songs “Vingilot” and “Bad Ghost”. I have always been a Christian, and my faith remains the center of my life. A few years back, I joined the Catholic Church, and that has exposed me to an incredible depth and richness in Christianity that I had no idea existed. Still, one of the reasons I’ve struggled with writing about Christian things here on TrueMyths is because I didn’t want my writing on these matters to be for Catholics (or Christians) only. While I do consider myself an orthodox Catholic, I very much believe that the truths of Christianity and the person of Jesus Christ are for every human being. I hope to explore Christianity in such a way as to help fellow Christians on their respective journeys, but I also hope to open it up to anyone who stumbles across this blog, no matter what their religious affiliation is. In addition to my continuing exploration of Tolkien’s faith, you’ll probably find me writing about the thought of Christian greats such as St. John the Apostle, C.S. Lewis and Thomas Merton (among many others). Though my focus will mainly concern Tolkien, Music and Christianity, I often feel a need to write about things that don’t fit into one of these categories. Therefore, from time to time, I’ll be writing about my perspective on matters ranging from movies (Star Wars! Raising Arizona!) to TV shows (Star Trek! Breaking Bad! Fargo!) to classic video games (Zelda! Star Control 2!) to being a dad (Awesome! Lots of work!) to sports (Let’s Go O’s!) to great (non-Tolkienian) literature to astronomy to quantum physics to cute pictures of kittens to whatever else the spirit moves me to write about. One thing my Christian faith inspires in me is the idea that everything is imbued with a deep sense of meaning and is a means for discovering and deepening our knowledge of the eternal. Even cute pictures of kittens (maybe especially cute pictures of kittens). Obviously this is profound and worthy of contemplation. The tagline I’ve been using in my own head for all this? “Mystical mutterings on Tolkien, Music, Christianity, and Everything Else.” It’s wordy, but it fits. I’m quite excited about what the next year will hold, and I invite you to bookmark or feedburn this site and to tell others about it. The Incarnation is one of the central mysteries of Christianity, and it’s the heart of the matter when it comes to Christmas. It is the teaching that the Son of God, being divine, loved us human beings so much that He became one of us in order to redeem us from sin and death. Tolkien spoke a lot about “incarnation,” especially in reference to his Middle-earth works, where some of the “angelic” figures (the Ainur) would take on human form much like we’d put on clothing (for example: Gandalf). In a few specific cases, however, Tolkien spoke directly of his views on the Incarnation of Christ. These instances show how vitally important the holy mystery of the Incarnation was to Tolkien. In a letter to Michael Straight (editor of New Republic magazine), Tolkien spoke of Gandalf as an “incarnate” being who died and came back to life. Knowing that statement would allude to the Gospel itself, he immediately qualified the connection by stating that Christ’s Incarnation “is an infinitely greater thing than anything I would dare to write”. In saying this, Tolkien only says what dozens of great Christian writers have said for centuries: the mystery of the Incarnation contains unimaginable riches, for it has brought heaven into a broken world, and brought Eternal Love close to broken human beings. Coming from one of the greatest imaginations in human history, this is a startling admission. Tolkien bows the knee to the Incarnation not only as a Christian (in its truth), but also as an artist (in its beauty and glory). The Incarnation is not only the turning point of human history, but it is a story itself, with its own turning point. The idea that God would become a man in order to show His love for mankind is a powerful one in and of itself. The idea that He would go so far as to suffer a gruesome death for the sake of our redemption is even more profound. And the happy turning point of that story – the Resurrection – is the reason mankind can stand up with steadfast hope in the face of evil and death. Hope – a certain hope – has dawned upon a world shrouded in darkness. Tolkien’s point in all this is to identify the story of the Incarnation as the central story, the story from which all other stories (especially the stories of our lives) take their vitality and meaning. When we view our lives (and the whole story of mankind) in this light, it can’t help but change how we view everything. It is in no way easy to make sense of the way Tolkien related his religion to his creative endeavors. In part, that’s why I created this site, and one of the key things that so draws me to Tolkien. On one hand, Tolkien would seem to deny in no uncertain terms the symbolic correlation between an aspect of his work and some Christian doctrine. On the other hand, he would tell a Jesuit friend that The Lord of the Rings was “of course a fundamentally religious and Catholic work” (Letter 142). Examples for both cases abound. For many, this means Tolkien was either crazy, confused, or simply willing to tell people what he thought they wanted to hear. However, the other option is that Tolkien held a deeper view that was far too difficult to explain in a few words (perhaps even one that he had trouble putting into words himself). This sort of idea seems to be all over “On Fairy-stories” (Primary and Secondary Worlds, seeing things as they are meant to be seen, etc) and other works as well (“Mythopoeia”, “Leaf By Niggle”, all of Middle-earth). Furthermore, it would seem that for the mystics I am aware of, spirituality and creativity go hand-in-hand. That’s why I can seem so insistent sometimes that it’s not entirely appropriate simply to draw a convenient diving line between Tolkien’s religious beliefs and his creative works. The incarnate mind, the tongue, and the tale are in our world coeval. On the surface, the meaning of the above quotation appears straightforward: humans have always used language to tell stories to one another. But why, in the expression of this idea, do we find the noun ‘mind’ modified by the unexpected adjective ‘incarnate’? My attempt to answer this question generated the following reflections on the foundations of Middle-earth. First, the adjective itself. The Oxford English Dictionary gives two definitions of incarnate: (1) a god or a spirit in human form, and (2) a quality in physical form. The OED also provides general and particular definitions of the corresponding noun: the lower case incarnation: the living embodiment of a god, spirit, or quality; and the upper case Incarnation: the Christian belief that God the Son was embodied in human flesh as Jesus. But how powerful… was the invention of the adjective: no spell or incantation in Faërie is more potent… When we can take green from grass, blue from heaven, and red from blood, we have already an enchanter’s power… in such ‘fantasy’, as it is called, new form is made; Faërie begins; Man becomes a sub-creator. Such imitation, it is important to note, occurs in means as well as ends: language is the instrument of both (divine) creation and (human) sub-creation. And God said: ‘Let there be light’. And there was light… And God called the light Day, and the darkness He called Night. And there was evening and there was morning, one day. (Genesis 3, 5). Yet the role of language in sub-creation as explained by Tolkien does not exactly mirror the linguistic dimension of God’s creative work as described in Genesis. In creating first light and then time, God employs no adjectives. In emphasizing the adjective as the key to sub-creation, Tolkien’s ‘On Fairy Stories’ reveals what we might call an ‘incarnationalist theory of language’. For sure, abstracting and remixing adjectival qualities is not an exercise in incarnation. The projecting of a novel quality (say, blue) onto a noun (say, the moon) to form an image (of a blue moon) occurs on a purely mental and linguistic level – a “new form is made”, as Tolkien puts it, not a new thing, let alone the embodiment of spirit in living flesh. Nevertheless, the making of imaginary form is structurally similar to the Divine act of incarnation. This is because the objects given to us by language possess the same dual nature as the incarnate spirit: a concrete object (noun) possesses abstract qualities (adjectives). The speakers of human language engage in fantasy by putting novel qualities into different linguistic objects. Put another way, the ‘incarnate mind’ is an actual instance in the world of the same dual form – the fusion of concrete and abstract – that is given to us generally in language. Indeed, it is tempting to see the incarnate mind as the anchor in reality of our linguistic practice. We can now answer our original question. Invoking the ‘incarnate mind’ at the start of his explanation of fantasy, Tolkien points not only to the maker of fantasy but also to its very nature: a linguistic process whereby an embodied soul creates a secondary world by embodying unexpected qualities in imaginary objects. A careful reading of the quotations from this single passage in ‘On Fairy Stories’ suggests a further, complementary train of reflection. Our initial sentence identified stories and language as coeval. But Tolkien goes on to speak of the invention of the adjective, suggesting that such modifiers were a later discovery of the human mind. Could it be that this invention was of more than linguistic significance? Did the discovery of the dual nature of linguistic objects also provide illumination into the mysterious nature of reality? I believe that legends and myths are largely made of ‘truth,’ and indeed present aspects of it that can only be received in this mode; and long ago certain truths and modes of this kind were discovered and must always reappear (Letters, letter 131). The Christian doctrine of the Incarnation is generally absent from Arda (although it is clearly alluded to as an ‘Old Hope’ of mortal men in Tolkien’s late dialogue, the ‘Athrabeth’). Yet the general idea of the embodiment of spiritual power in material objects is a recurring theme in Tolkien’s mythology. In the very first pages of The Silmarillion we are told how the world was first made by music, then appeared as a vision, and then came into being with the speaking of a word. Yet this created world only “came alive” when some of the Ainur descend into it: “so that they are its life and it is theirs. And therefore they are named the Valar, the Powers of the World”. This incarnation of the Valar in the world is not some incidental detail of Tolkien’s creation story. It is the reason why Arda – in contrast to the mechanistic world envisaged by Newtonian science – is alive, enchanting, and purposeful. In our modern world, machines are purely physical means of generating and utilizing power. But a true Power in Middle-earth draws on a spiritual force that Saruman loses even as he builds in Isengard the superficial appearance of industrial and military power. Further acts of incarnation – or, at least, the embodiment of the spiritual within a material object – provide the defining moments of Tolkien’s mythology. 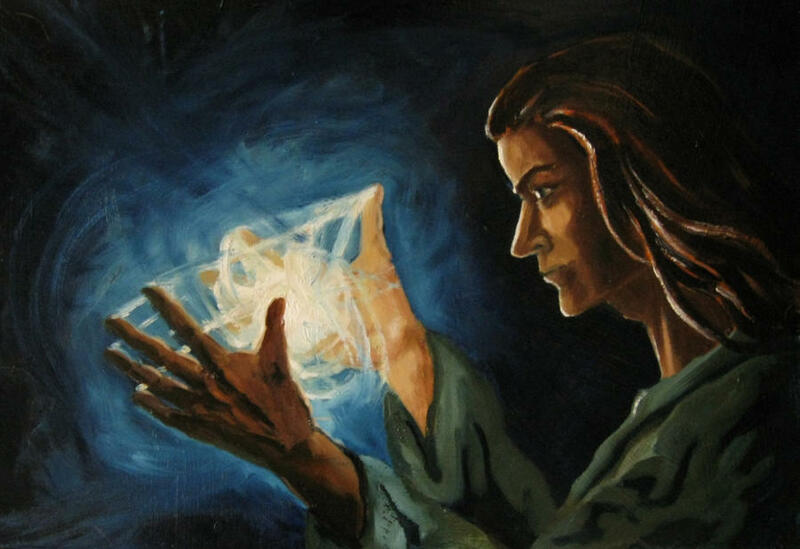 Fëanor embodies the spiritual light of the Valar in physical form – the Silmarils. And long ages later, Galadriel places the light from one of these Silmarils in a phial that she gives to Frodo, who, together with Sam, carries it all the way to Mordor. Again, Sauron puts much of his own power into the Ring – a seemingly inanimate object with a will of its own. Here is a useful reminder that not all incarnations in Arda are good. Morgoth was one of the Valar incarnated in the world, which is why more than one power strives to shape the fate of Middle-earth. Our reflections upon Tolkien’s reference to the ‘incarnate mind’ in his 1939 lecture on ‘Fairy Stories’ have led us to the following tentative conclusions concerning the foundations of Middle-earth. The central fact of Tolkien’s worldview was, undoubtedly, the Incarnation: the Christian doctrine that the Word was made flesh. This fact has no direct bearing on either the form or the content of Tolkien’s mythology, which concerns a world that has not received the Gospels. Indirectly, however, it is of cardinal importance. Arda is a mythological world that does not know the Incarnation, but which is largely made of the discovered ‘truth’ of incarnation. Simon J. Cook is an independent scholar. His essay on Tolkien’s lost English mythology is published by Rounded Globe and may be downloaded from the Rounded Globe website. Links to his other publications may be found on his personal website, Ye Machine. Once upon a time there was a man who loved words. Because he loved words, he loved languages, and even created some of his own. This man’s love of language drove him, over the course of a lifetime, to create something vast and inspiring, and overall, to tell many stories, but more than even telling stories, his love of language drove him to create another reality, one he saw in his mind’s eye, as if it were a real thing that he was glimpsing from afar through a mist. Yet there was another side to this man, a deep and abiding belief in the goodness of the world he lived in, grounded in his delight in nature and in the religious faith that he had received from his mother. It was a haunting faith, for it often seemed to seep into matters in which it had no business, and though his stories were in no way about his faith, over time he realized it was increasingly difficult to keep the likeness, the aura of that faith, from creeping in. Yet still, he was compelled to tell the stories he had to tell. I cannot speak of this series in terms of things that most certainly will be accomplished. All I know is that I am going on a long exploration of Tolkien’s faith, and that I hope in so doing to understand and show how a deep appreciation of Tolkien’s faith can lead to better reading, better art, and better faith. Tolkien once said “The Lord of the Rings is of course a fundamentally religious and Catholic work…” At this point, those words have been quoted ad nauseam, both here and elsewhere. It’s a rather direct statement from a writer who wasn’t known for his brevity and a convenient quote by which Catholics can identify Tolkien and his most beloved work as “one of ours.” With that in mind, let me insist that this series will not include a post entitled “The Passion of Bombur” nor will I be counting Christs in Middle-earth. Yet even so one must ask, “What did he mean by those words?” How can Tolkien’s insistence that The Lord of the Rings is “a fundamentally religious and Catholic work” help ALL readers – Catholic, Christian, or none of the above – become better readers of his works, to get more out of the stories he was trying to tell? The funny thing about this quote is that he was often careful to dissuade readers from trying to read intentional symbolism into his works. He “disliked allegory” and frequently shot down allegorical readings of his works proposed by others. So why would he go out of the way to do so, and then turn around and call the work “fundamentally religious and Catholic”? I believe that in this paradox Tolkien identified a way of thinking and of storytelling that amounts to a “best way.” Essentially, Tolkien was trying to encourage readers to receive stories as stories and not as symbolic arrangements meant for driving home talking or teaching points. What if, as readers, we could live inside the story as we read it? How did Tolkien’s faith impact his ideas of storytelling, and how can that help us to be better readers of Tolkien and of other works? Can being better readers help us to live better lives? Tolkien was so obsessed with the idea of artistry that he coined his own term for his philosophy of it: subcreation. This concept was closely tied to his faith, for though many would say we human beings are “creators”, Tolkien included the prefix “sub-” in order to specify that this peculiar aspect of human nature had to do with our status as beings uniquely made in the image of an original creator. He was so enamored with artistry that he made it one of the prominent themes of his Middle-earth works. In fact, I might even venture to say that in hindsight Tolkien’s life-work amounts to a thorough and profound development in the philosophy of human creativity. The fact that so many of his fellow human beings connected with his work on such a visceral level tells me that we ought to be paying closer attention to what he was saying about it. In some cases, this aspect of Tolkien’s work seems to take on a mystical quality. Consider “Leaf By Niggle“, his short story about human creativity and eternal destiny. It’s a tale that Tolkien was suddenly inspired to write in one sitting. It rings with a joy “beyond the walls of this world” and simultaneously stands as a stern and humorous rebuke of the sort of materialist thinking that so oftens stands in the way of great art and beauty. Just how important is it for us human beings to invest ourselves in the creation of beautiful things? Indeed, is beauty a salvific and redemptive way? What actually constitutes good art? I truly believe that Tolkien has immense value to offer to Christianity, both its thought and practice. I believe this because for years before I was Catholic I perceived in Tolkien an inviting presence, a pleasant and wide spiritual space, a relief from the madness of the present world with all of its despair, loneliness, and ugliness. In some way, Tolkien’s works were like a quiet country church in my mind, a place to simply be and marinate in the good, the true, and the beautiful. Simply put, they seemed a refuge. And I know of others who tell the same story. Even though Tolkien was devout, it was as if he was content to let his fictional writings do the most powerful work of evangelism. It’s not that he never shared his faith. He certainly hoped to convince others of it; after all, there’s this guy. It’s rather that in so doing he couched his faith in terms that actually appealed to the sleeping and defeated giant within modern man: the desire for unending happiness. Tolkien’s works awaken this within us in a thousand ways. Who can read Sam’s astonished cry “Is everything sad going to come untrue?” and not WANT THAT? That being said, Tolkien’s works don’t fit any sort of triumphalist mode. Frodo fails and is wounded beyond the hope of this world; Gondor takes but a century to slide into satanism; and then there’s the problem of Túrin Turambar. ** As much as Tolkien believed in the happy ending he also believed in the long defeat. The shadow most certainly lies heavy on all of his work. Yet Tolkien’s broad appeal and his unswerving faith stand. In a time when, at least in the West, the influence of Christianity is waning, what can the Church learn from one of her own sons about how to reach people with the light of Christ? Is our decline in some degree a failure of our imaginations? I have here only put on my boots, wielded my walking stick, and taken a deep breath as I step out the door. This road goes ever on, and if I tried to thoroughly map it out to you, I’d be a fraud. We venture into a mystical place, the vast realm of one man’s soul, and a great soul at that. So where are we going? We’ll know when we get there. What aspect of Tolkien’s faith or work do you find most compelling? I’d love to hear from you in the comments below. ** Just be glad you’re not Túrin. Welcome to Tolkien Catholic! J.R.R. Tolkien was one of the most beloved and successful writers of the 20th century. While many people today know something about The Lord of the Rings or The Hobbit, very few are familiar with the outlook and artistic convictions that drove the Oxford philologist to spend much of his life creating a vast fictional realm. I aim to change that. In August, I completed my Master of Arts degree in English with a thesis focusing on Tolkien’s literary aesthetic. In the course of researching and writing my thesis, I had the opportunity to become thoroughly familiar with many of Tolkien’s lesser known works. During this intense process, I came to develop a deep love not only for Tolkien’s fictional works but his philosophical and artistic perspective as well. Furthermore, as a recent convert to the Catholic Church (2010), I recalled thinking so often in my pre-Catholic days that if Tolkien, as a devout Catholic, created such rich and fascinating literary works, then there must be something to this Catholic thing after all.